LEN - www.lankaenews.com | Dayasiri the Rs. one million bribe taker ‘s profusion of lies and bluffs exposes his crime further ! Has he answers to our questions ? Dayasiri’s father from during the days he was engaged in business knew Aloysius as a businessman. Dayasiri who admits that he collected Rs. 1 million from Aloysius, unbelievably does not remember whether he collected that sum on a check signed by Aloysius himself . H e also said that check was not written in his name , and does not remember through whom that check was cashed. Further , that sum was gifted to him for his election campaign , and receiving such gifts are a common practice during the period of elections, he added. Dayasiri who even went further said , there are other MPs too in the parliament who received such payments , without revealing their names. If Aloysius who is now 33 years old was doing business that long ago with Dayasiri’s father , then Aloysius must have been transacting businesses even when he was in his mother’s womb. Is that acceptable ? Or ,is that Dayasiri does not know his real father ? Why did Dayasiri while pretending like a great hero and talking nineteen for a dozen about the Bond scam , hide this collection of payment (for elections or otherwise) , until this came to light via the CID report in court ? If Dayasiri is that clean , uncorrupt and virtuous couldn’t he have announced like a hero , ‘This bond scam crook gave me also money, and I accepted that without knowing he is a crook. Hence , I am immediately returning his money.’ At least he could have told this in Parliament on the 25 th . Why didn’t he say that ? Dayasiri vowed in Parliament he collected this sum for election campaign . It is noteworthy , this check has been cashed on 2015-06-15. What was the election campaign which was conducted on that date? At that time Dayasiri was the chief minister ,Wayambe province . Therefore it were provincial council elections which applied to him. It is a well known fact there were no PC elections at that stage. If he is trying to say he was referring to parliamentary elections , on 2015-06-15 no such parliamentary elections had been scheduled. Even nominations for the 2015-08-17 parliamentary elections had not been announced. That announcement was made by the president only on 2015-07-05 . How can he therefore say this money was received for election campaign when there were no elections anywhere around the corner? Is Dayasiri assuming the people of this country would say ‘yes’ to his outrageous perfidies or that they are buffoons like him who would accept his profusion of lies? Dayasiri is repeatedly saying Aloysius’ check was not written in his favor is only in order to conceal the fact he is guilty. Besides he does not clearly say his bodyguard cashed the check and gave him the money. All what he says conveniently is he does not remember . It is apparent Dayasiri the great pretender has contracted the same ‘amnesia’ that afflicted all the shameless crooks, rascals and scoundrels of the Rajapkse nefarious decade . Dayasiri is trying to take refuge under the justification that not only he , others too collect payments from businessmen for elections . By this he is only confirming , he is not the only rascal , but all others too are , instead of proving he is innocent. A mouse caught in the trap tries every foul method to escape . Dayasiri as a last resort lambasted Lanka e news the only media which exposed this disgraceful ‘santhosam‘ collection of his.’ This Kurunegala Caroline Akka’ insulted the editor by referring to his illness . Dayasiri who crowed from rooftop that it was nothing but mudslinging against him when Lanka e news exposed his bribe taking giving details of the check No., Bank account No. , the date on which it was cashed , and the name of his body guard who cashed the check for him , must as a lawyer explain to the intelligentsia what meaning he attaches to the word ‘ news’ . Being more a liar and less a lawyer , the intelligentsia by now has formed the right irreversible opinion about him. Dayasiri lamented that LeN did not speak about the Bond scam , and we are today only reporting against him. . It is to be noted we have reported on the bond scam many times though those may not have been of concern for Dayasiri .Simply by pointing out that , can his grave crime of bribe (santhosam) taking from Aloysius whom he was lambasting until now be belittled ? He went with Shiral Lakthieke and Maithri Gunaratne to Kaduwela courts to rescue Lanka e news after it was set on fire ,Dayasiri said. By that revelation is he trying to convey he did a favor to Lanka e news , and therefore Lanka e news should not report the news that he took a bribe from Aloysius? Lanka e news had never sought favors from Dayasiri in relation to legal advice when he was in the opposition . Neither form Shiral Lakthileke , That is because never have they ever won a case in the history of this planet. Though they are unfortunate lawyers who can only proffer illegal advice , we on the other hand have been fortunate enough to refrain from seeking such advice. Though he talks today about his concern when arson was committed on Lanka e news , might we point out no case was heard in any court let alone Kaduwela court in that regard.. Not even an investigation conducted until today. May be Dayasiri is referring to the case when a Lanka e news editor (News) was remanded at that time, and bail was sought . LeN entrusted the case to lawyer Maithri Gunaratne because that was the choice of the news editor .Gunaratne did not handle that case pro deo . He was paid Rs.15,000.00 per day in 2011 . The fact that brief-less lawyers like Shiral and Dayasiri roamed the court precincts in search of cases seeking cheap publicity via the media to pose off as heroes(cardboard ) does not mean Lanka e news is to be held responsible for that . During that period we entrusted the legal task of getting the news editor released on bail by paying Rs. 15000.00 to Maithri Gunaratne.. If Dayasiri is trying to say like other black coated sharks that he too was loitering around, aimlessly though , we advise him to ask from Maithri a part of the fee. Just sobbing and crying like “Kurunegala Caroline” at every place while talking about caste serves no purpose ( in this connection we have copious evidence in our possession). In response to Dayasiri’s announcement made maliciously that Lanka e news editor is slinging mud at him when the former is even unable to rise from the bed , we on the other hand have no such evil thoughts against him. LeN ‘s main ungrudging hope is , Dayasiri shall never be an invalid. Let us remind this One million ‘paga bloke ’ (bribe taker) even if LeN editor goes to the grave , not to mention bedridden , LeN will not die, for there are many million youths aligned behind us to carry on our crusade . (Dayasiri must furnish direct answers to the questions we have posed herein). 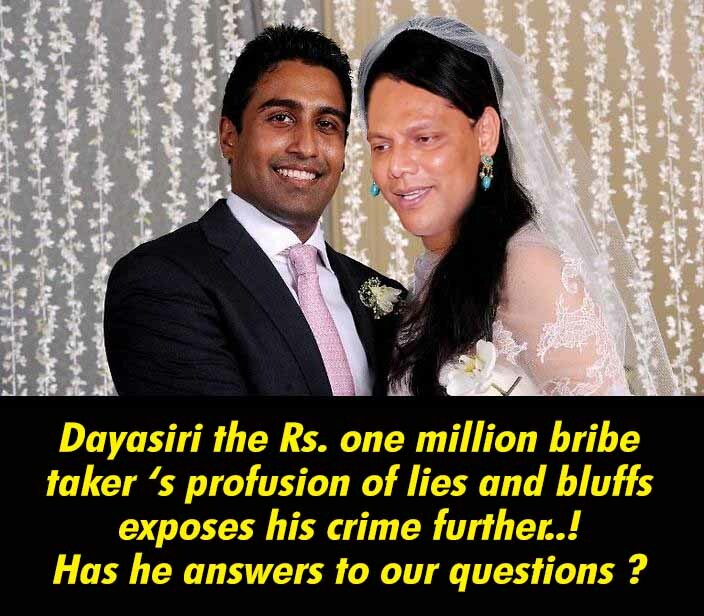 Dayasiri who parades as a paragon of virtue has taken 1 million ‘santhosam’ from Aloysius –his bodyguard exposes whereas DSG suppresses the truth ! Shame ! !